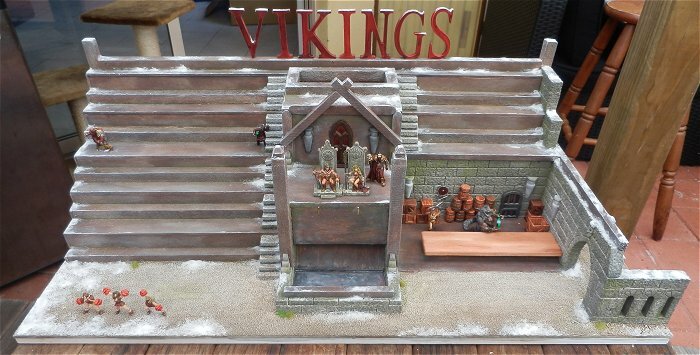 After finally getting my Blood Bowl team together (the Nevasober Vikings) and playing in the Rock’n’Rumble league, I decided to have some fun and build a custom stadium for the Sandgroper Cup. 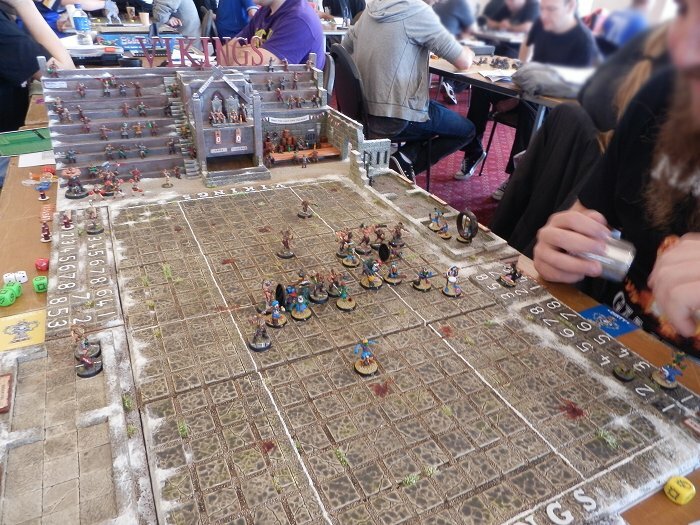 Sandgroper Cup is a very successful, 2 day Blood Bowl tournament held in here Perth, Western Australia. 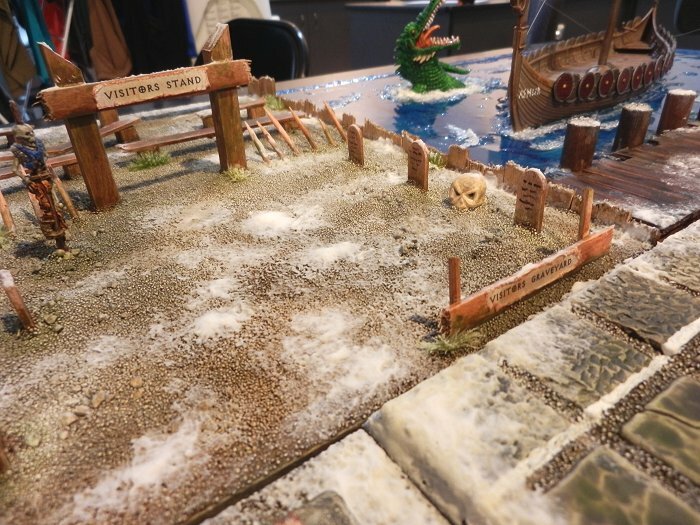 I have no illusions to being able to be overly successful at the event but there is an award for the best custom made pitch so I’m hoping to have a go at that. 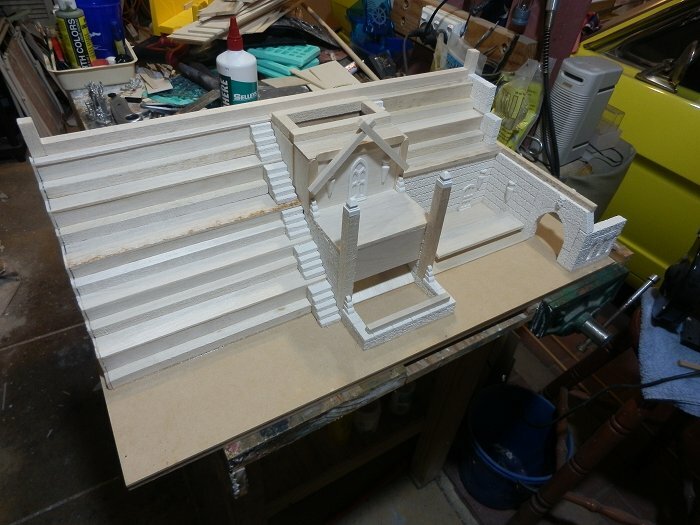 This will be a fairly simple pictorial/write-up of the build process. I’ve been collecting the parts for this stadium for the last 6 months. 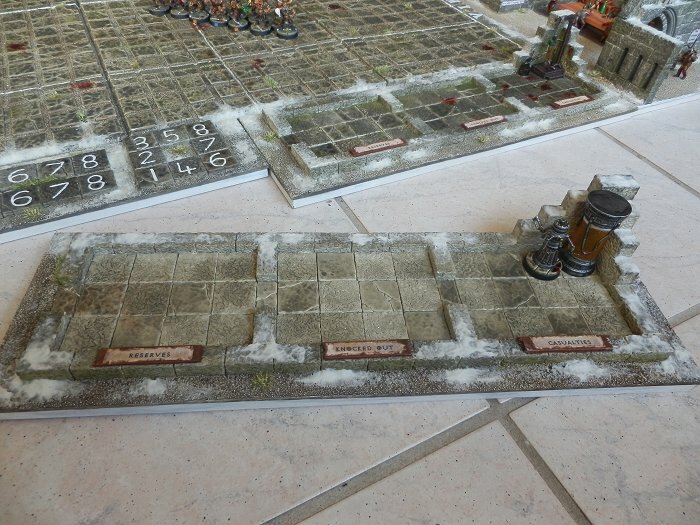 I spent a weekend casting up over 400 Hirst Arts blocks to make the pitch, the dugouts and the turn/re-roll trackers. 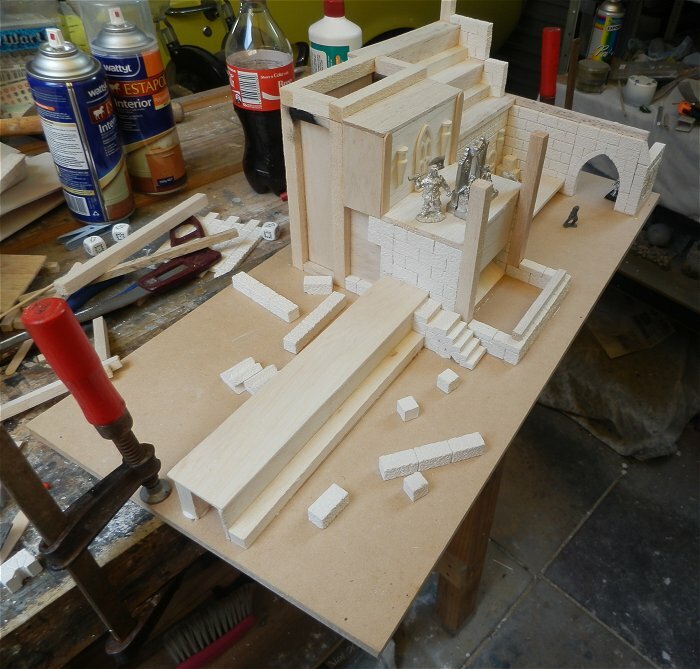 The base is 3mm MDF with a 10mm timber frame underneath to keep it flat and give it strength. I cut the MDF into 3 sections to make it easier to store. 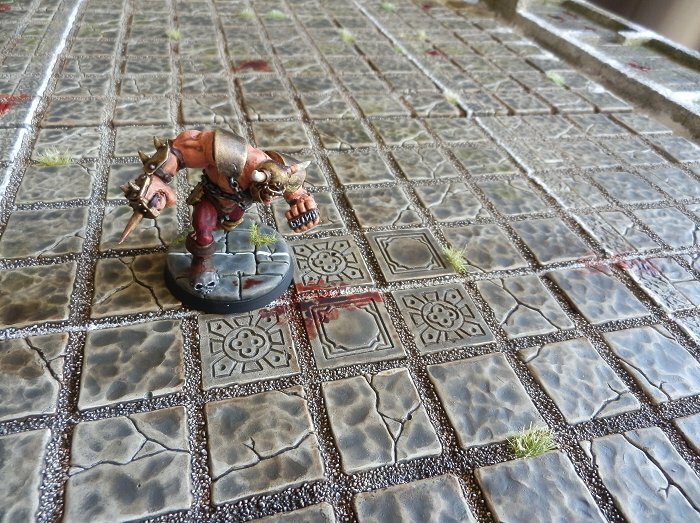 The pitch is exactly the same size as a standard Blood Bowl pitch. 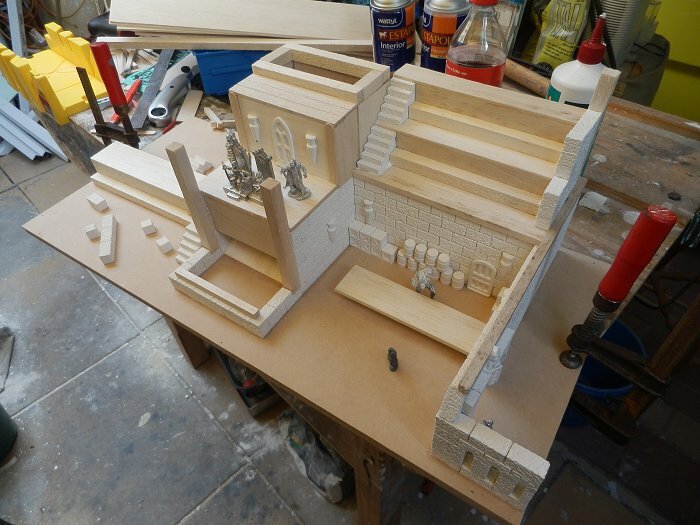 The Hirst Arts blocks are glued to the MDF with PVA glue. 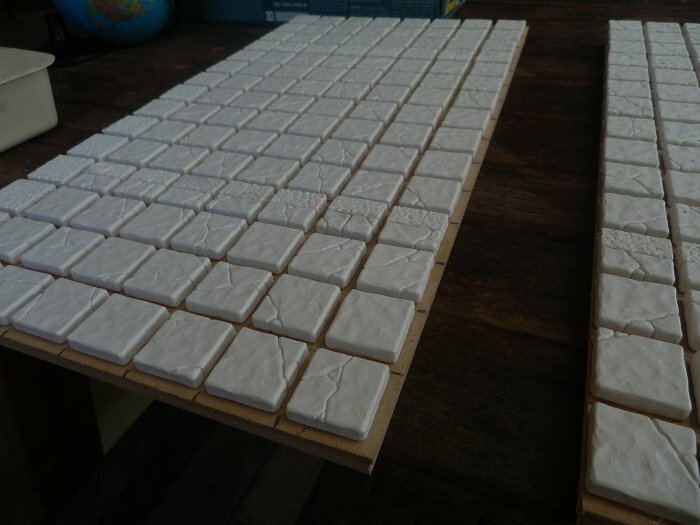 I filled the gaps between the tiles with PVA glue and sprinkled fine sand on. 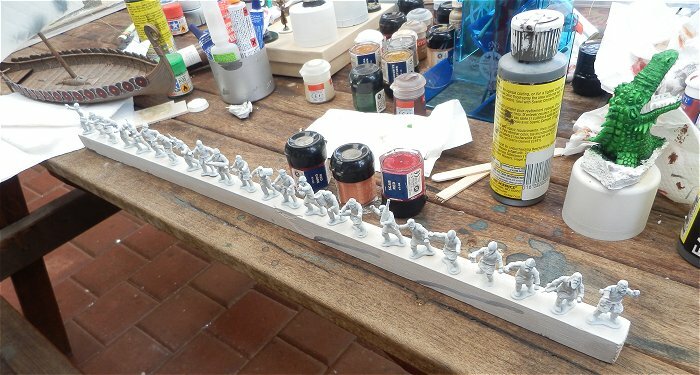 Whilst I was waiting for all the glue to dry, I set about building the team display board. This will sit next to the pitch once finished but can also be removed as a seperate display for the team. 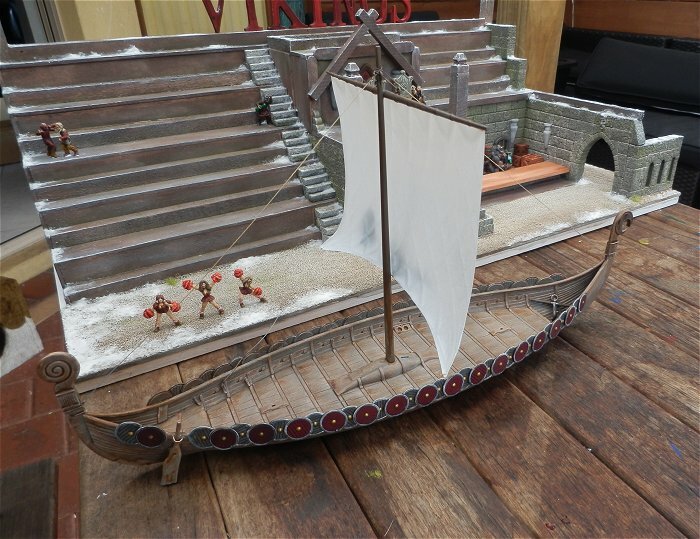 It will comprise of a Viking Longboat set in resin to represent the ocean. There will also be a dragon’s head bursting through the water next to the boat. 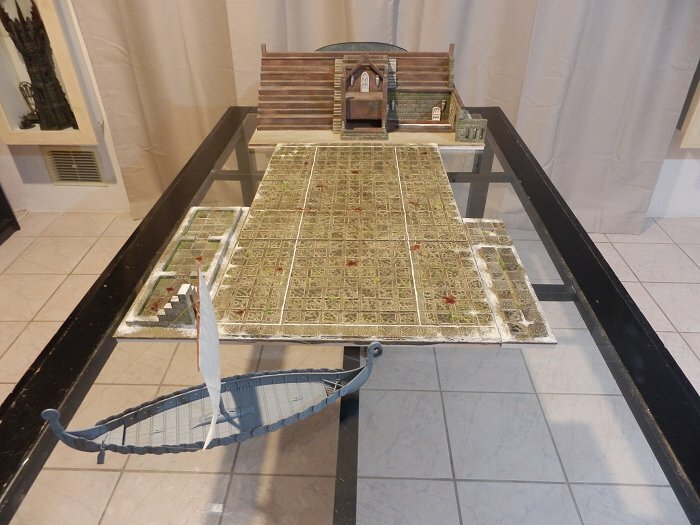 With the boat built, I turned back to the pitch. 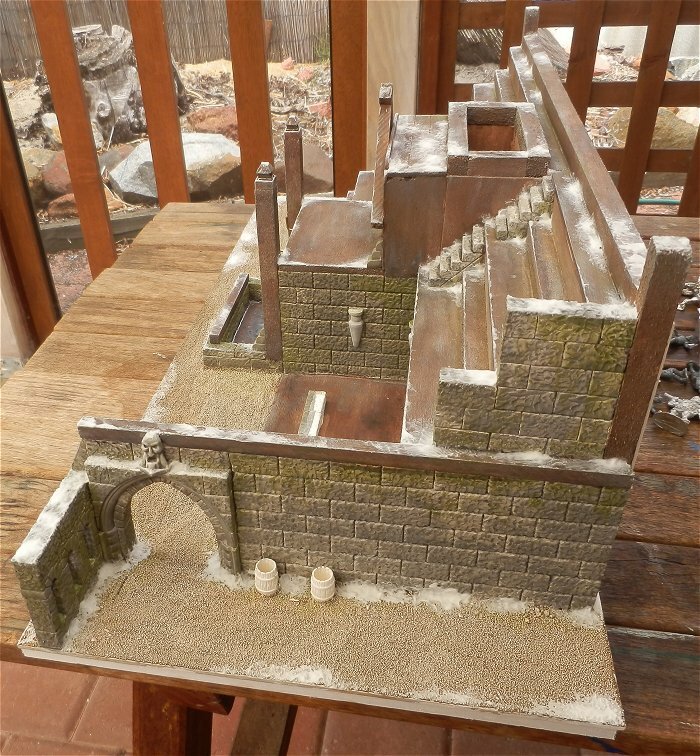 Several coats of White primer were sprayed on it. 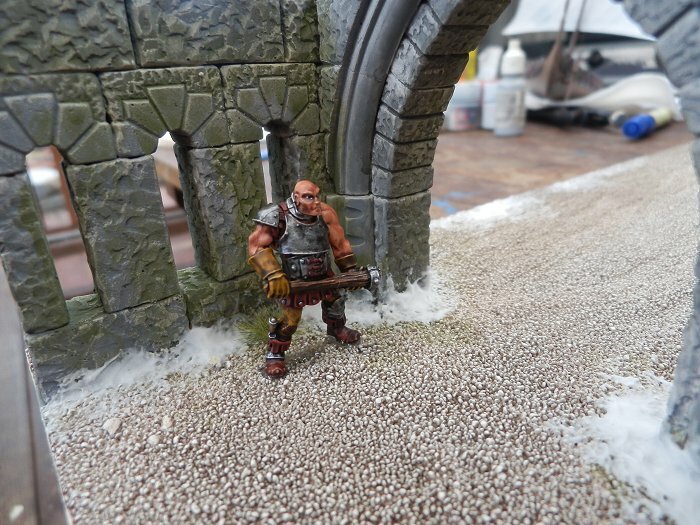 Once dry, I applied several coats of slightly diluted Woodland Scenics Stone Gray. The sand between the blocks was then washed with Woodland Scenics Burnt Umber. 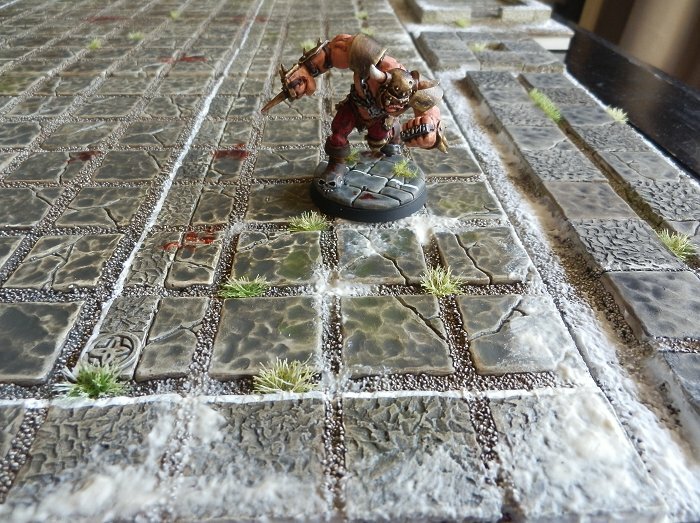 A few areas of the tiles were washed with Woodland Scenics Green Undercoat. 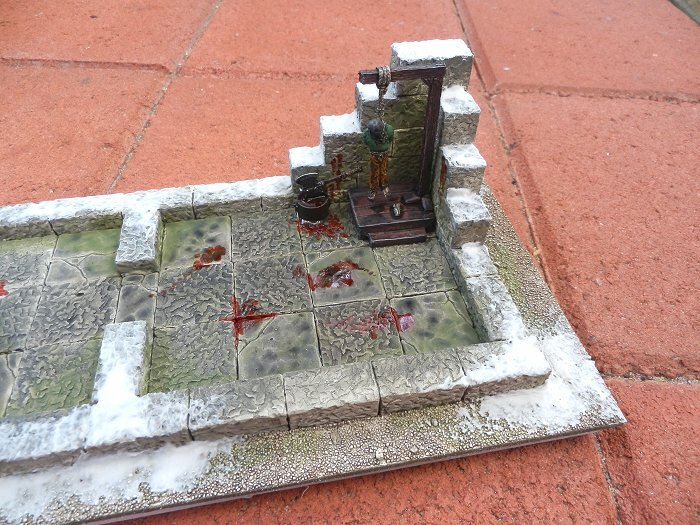 Then small splatters of blood were made using Tamiya Clear Red acrylic with a tiny dash of GW Chaos Black added to darken it. 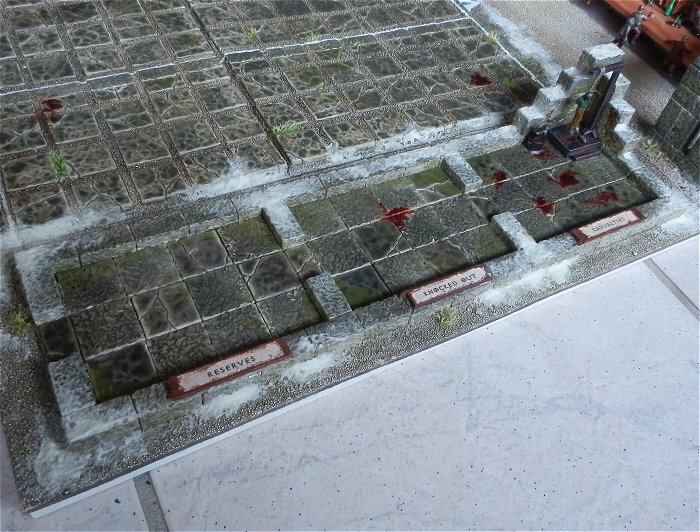 A few tufts of grass were fixed in place with PVA glue and the white lines were painted using GW Skull White. Bit more detail added to the pitch and one of the dugout and turn/re-roll/bouncing ball direction template made (still needs labels/numbers to be added). 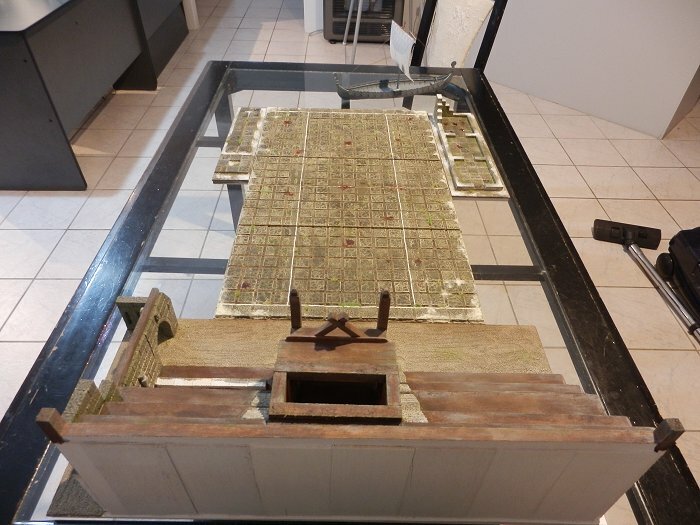 The center of the board. Photo showing the snow that’s been brushed off the pitch. 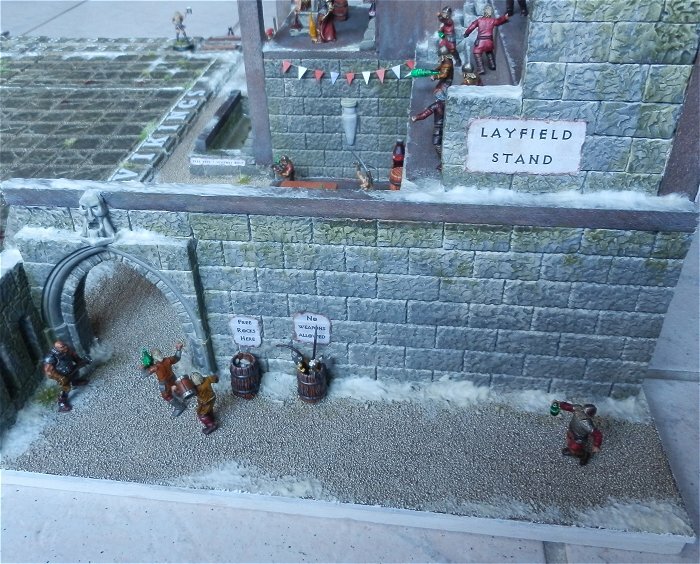 Here are some WIP photos of the home team supporters stand. 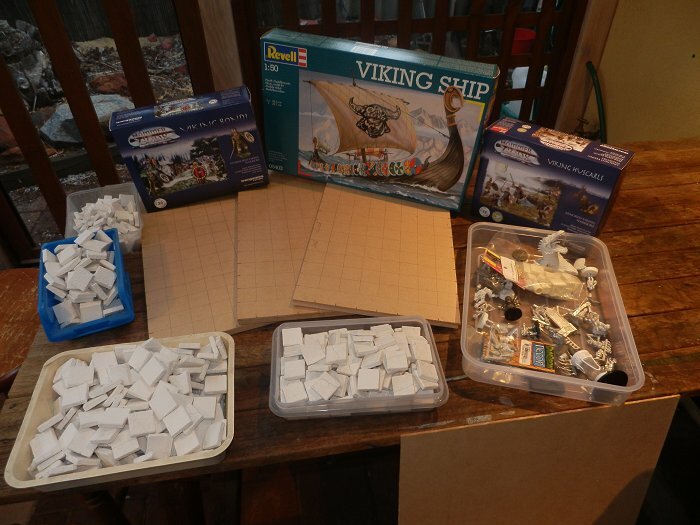 In these next couple of photos, I’m checking the lay-out of the various boards (still have more boards to add). Back to painting/detailing the home stand. Security at the main gate. 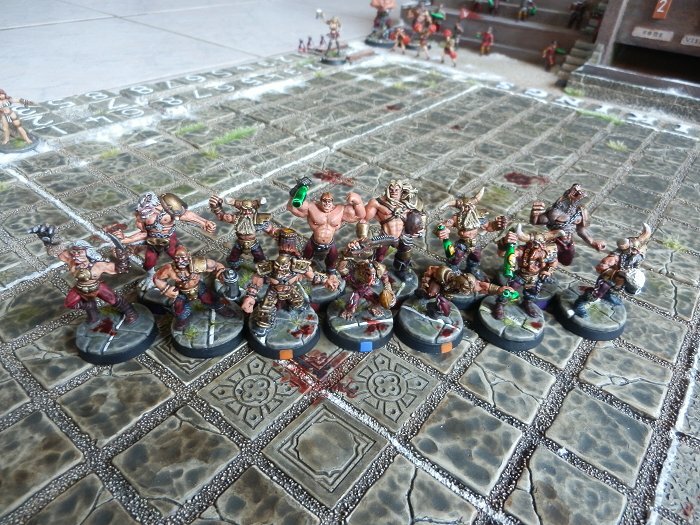 More Blood Bowl fans awaiting paint (20 are already finished). 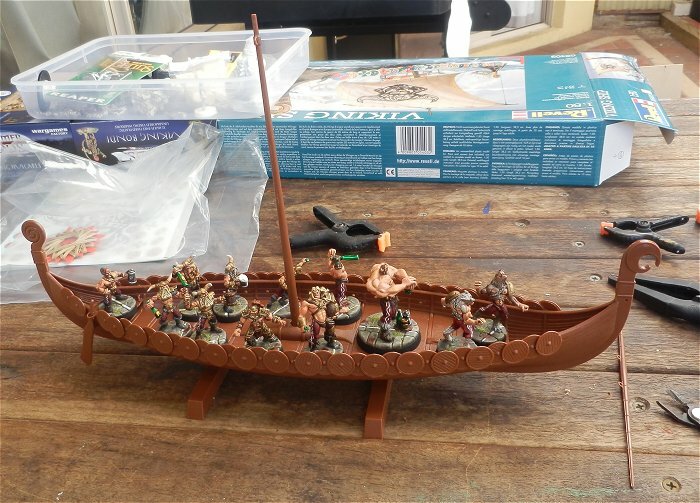 The longboat (named Aenur) is getting closer to completion. 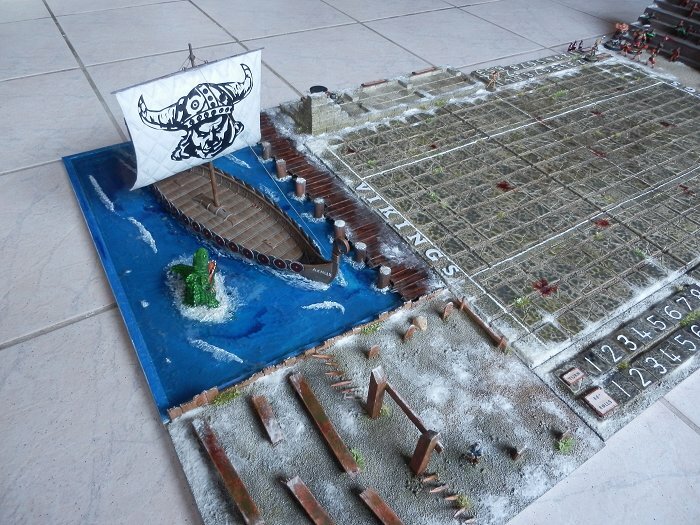 We’ve finished the stadium (thanks to my amazing wife) but as the Sandgroper Cup tournament is on this weekend, I’ll only add a few teaser photos for now. 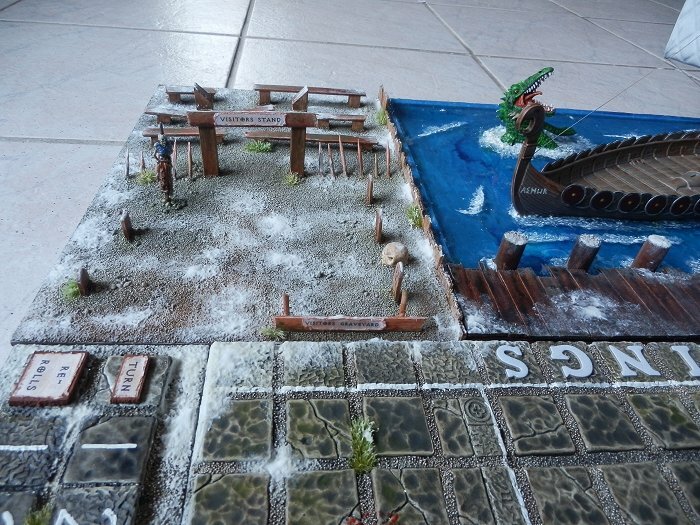 I’ll add photos of the finished board after the Sandgroper Cup. 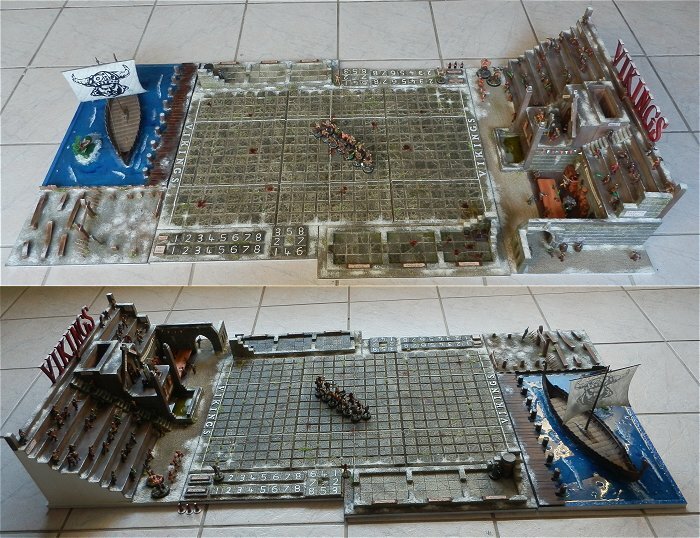 Right, the Sandgroper Cup has been run and won (by my good mate Duro) so here are the photos of the finished board. 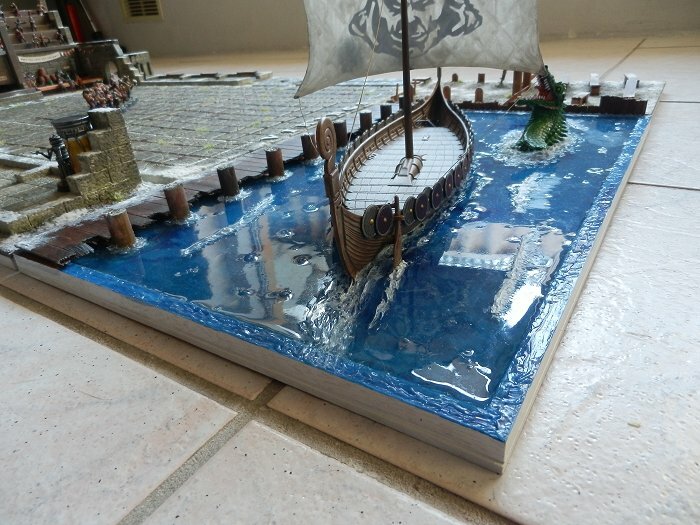 I used Glass Coat resin to make the sea and then used Woodland Scenics Water Effects to make the waves/ripples/splashes etc. 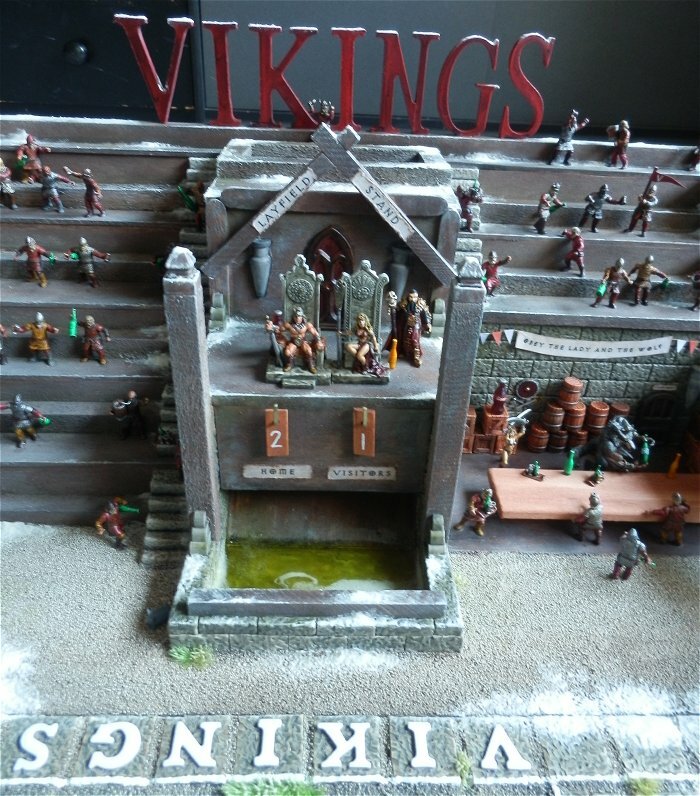 The Nevasober Vikings dugout. 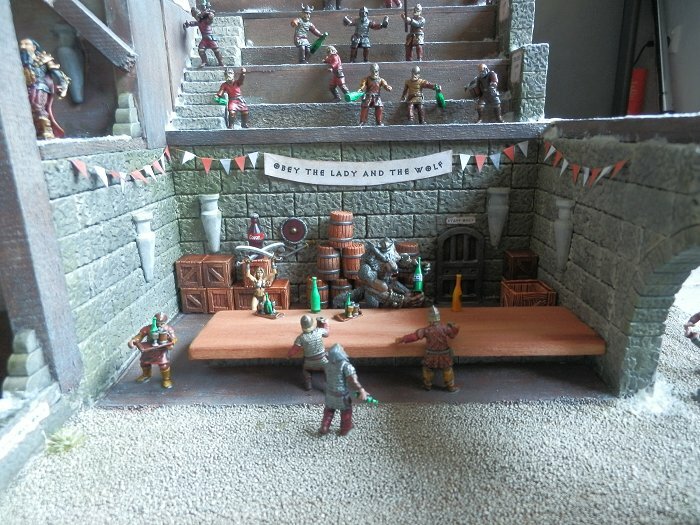 As you can see, the Vikings have a VERY good wizard on staff and he’s managed to conjure up a beer filled Bacta-tank and a medical droid! The main entrance for the fans. The royal box. 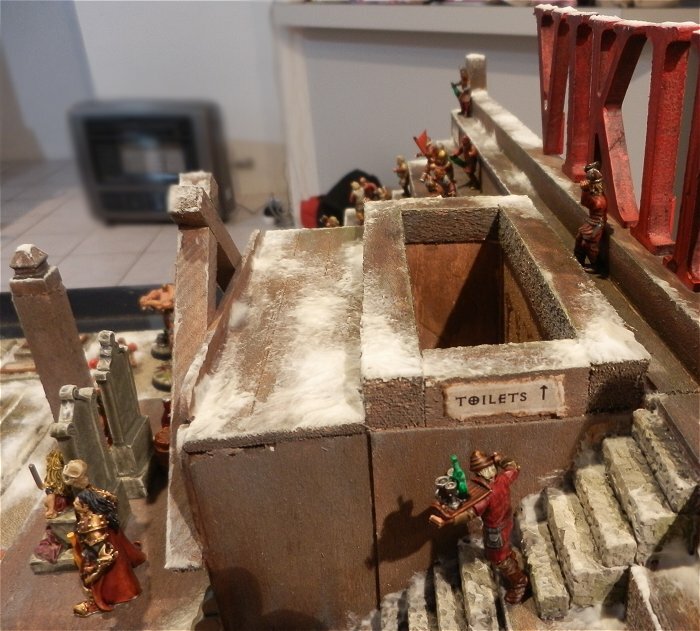 This is also the built-in dice tower. 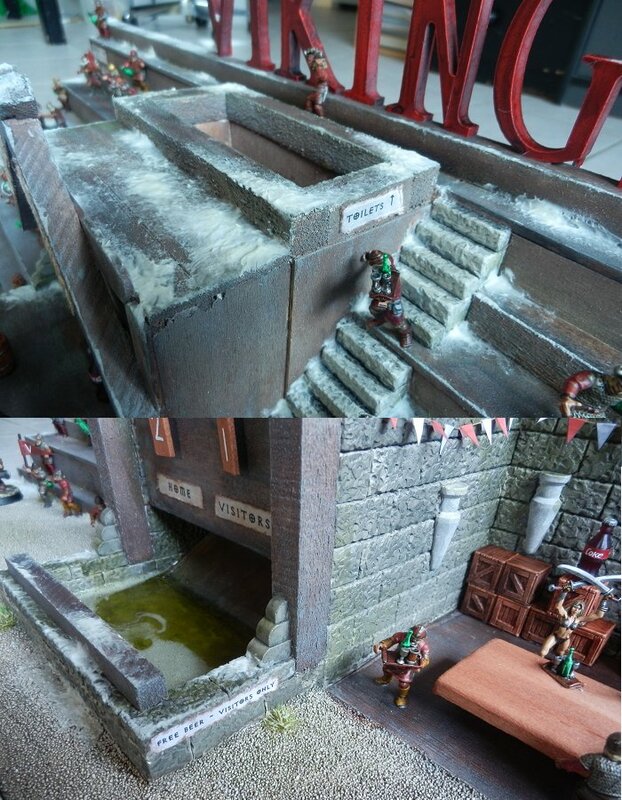 Here’s the top and bottom of the dice tower. I threw in a little toilet humour for a laugh. 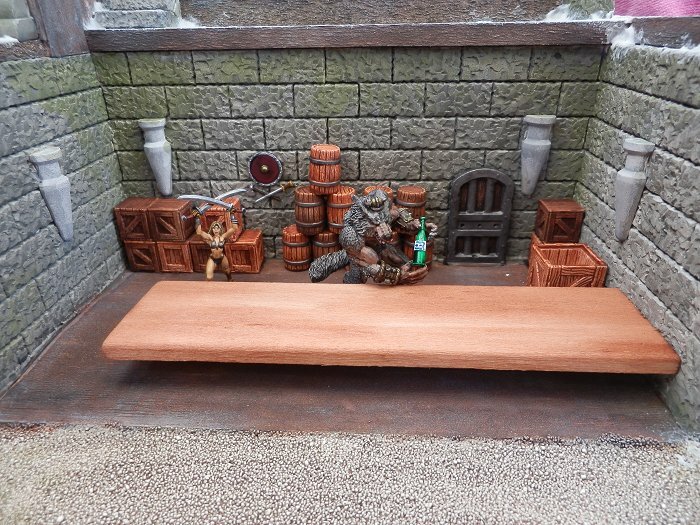 The bar is called The Lady And The Wolf. She is the head of security for the stadium (usually means keeping fans out of the beer cellar) whilst the wolf takes his job very seriously. 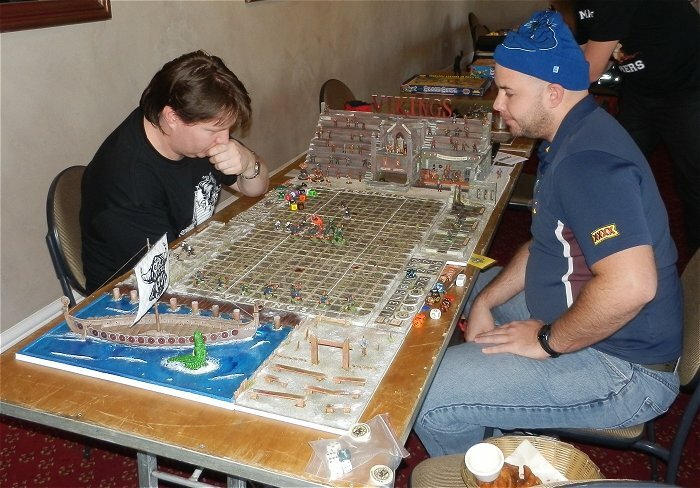 Here are a few phots from games at Sandgroper Cup 6. The tournament was a GREAT succes. 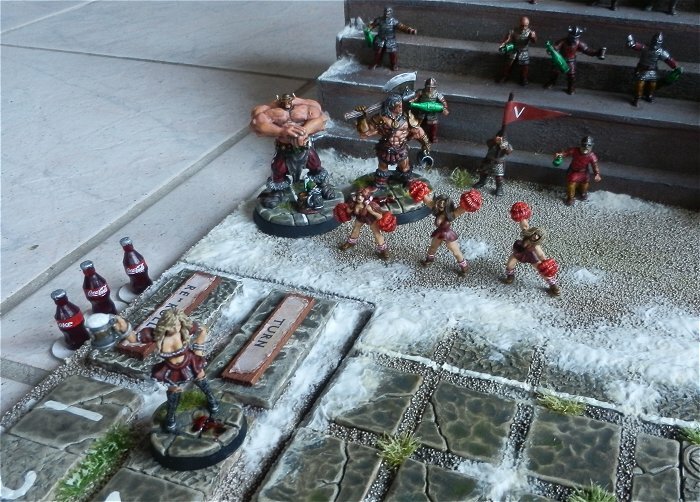 I managed to win Best Custom Pitch, Best Painted Team and Best Support staff. I also finished 14th out 46 with 3 wins, 1 draw and 3 losses (plus a few bonus points along the way). 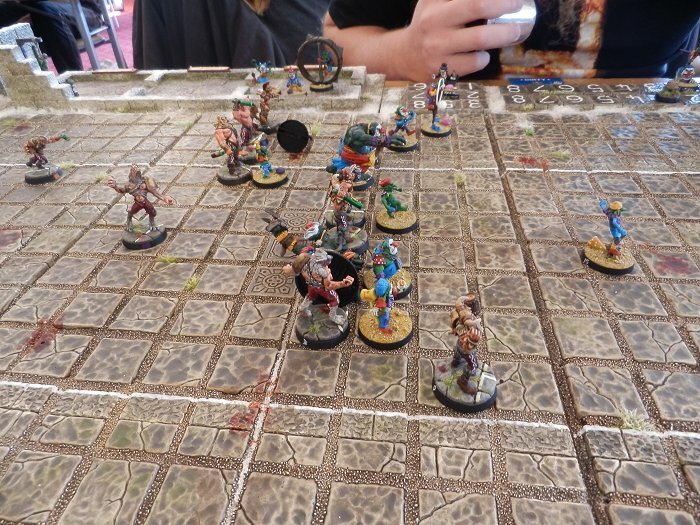 A top third result was completely unexpected as I’d only played 12 games of Blood Bowl before the event. Here’s a link to the official Sandgroper Cup site. 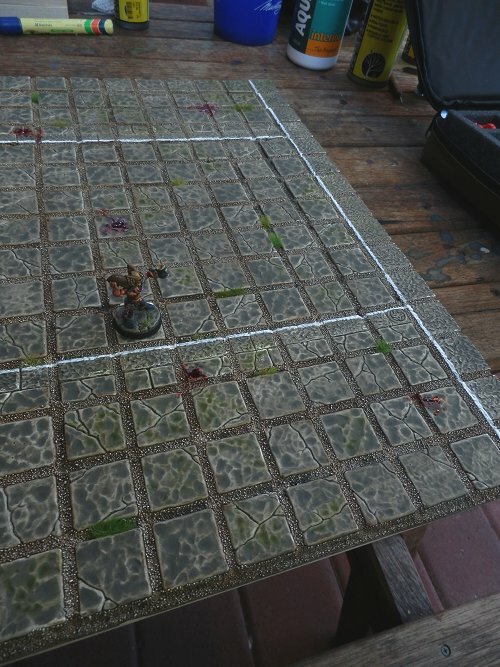 I love the idea of PVA Glue and fine sand between the tiles. That sounds muuuch easier than grout! 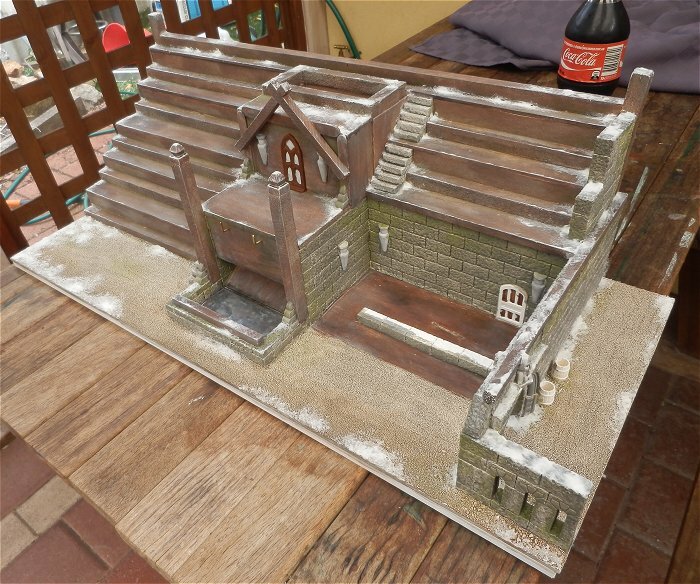 I need to re-visit your painting tutorial. My drybrushing is atrocious. Great stuff Steve, simply amazing. You are not a man to do things by halves. 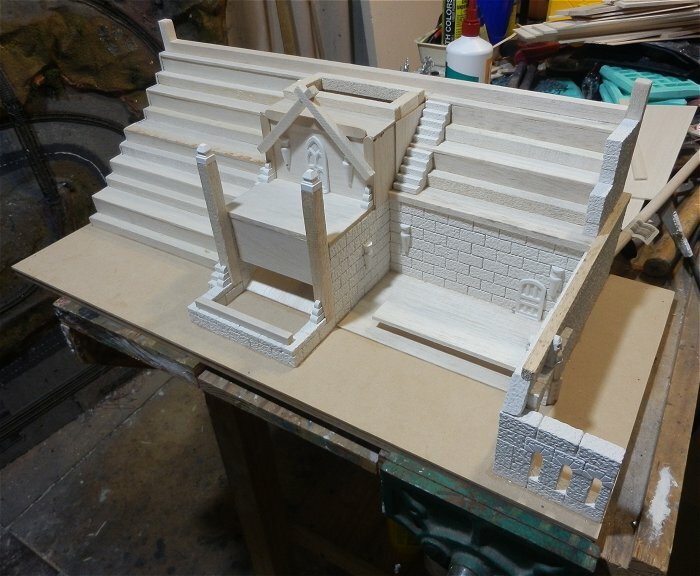 I am looking forward to seeing this one finished. 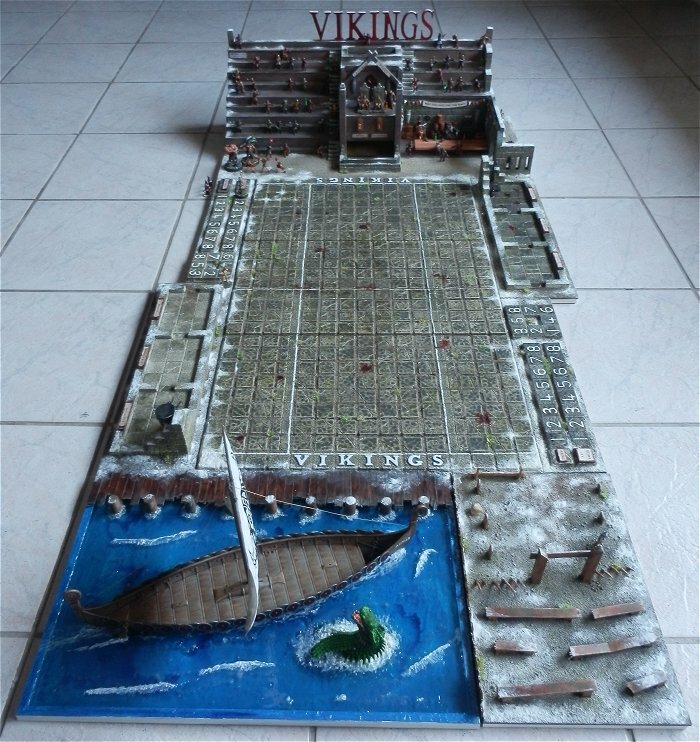 Absolutely fantastic work! I can’t wait to see this finished. Hi there, it just looks so great! Where did the king and queen come from? 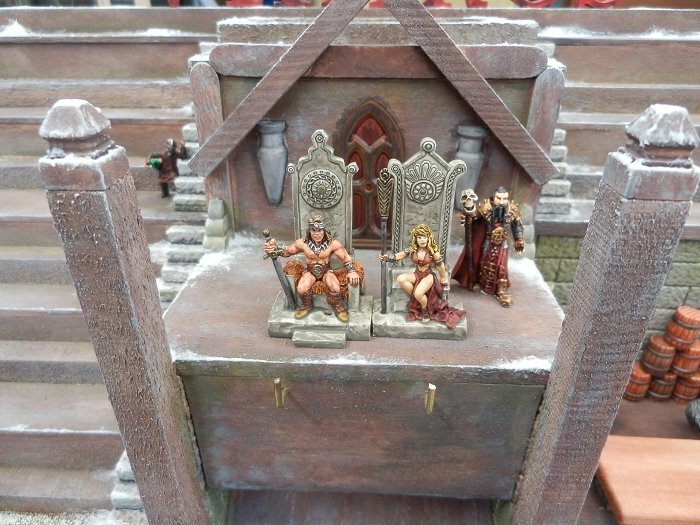 The King and Queen are from Reaper Miniatures. You did every BB fan proud with this pitch! 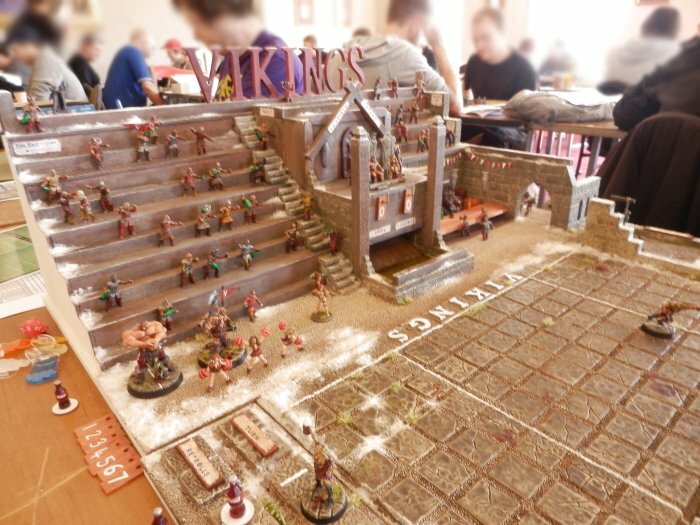 It is a work of art and I wish more of us had your skills because playing on such great boards adds so much to the game (at least for me)! 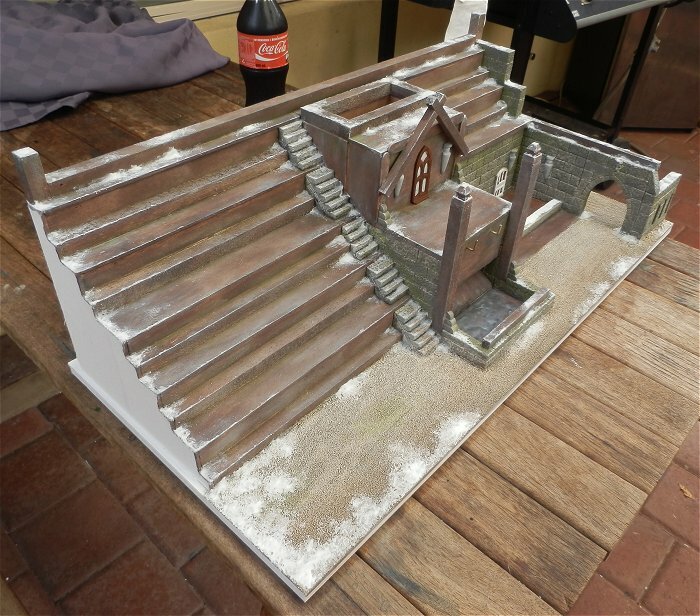 I buy my polystyrene from Foam Sales in Myaree. This pitch is genius. 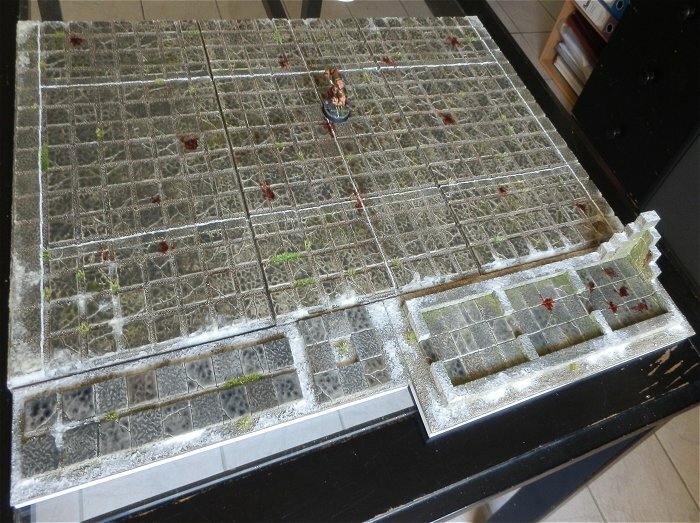 The dice tower is a brilliant idea. Love the whole thing! Totally awesome I must say! I’ve planned to make a pitch myself, Inspiring!! Almost quit making my pitch when I saw this, then I slapped myself round the face and told me to pull myself together. Awesome. Would you mind if I posted a link to this portion of your blog on our website so that people can look at the great stuff you do here? 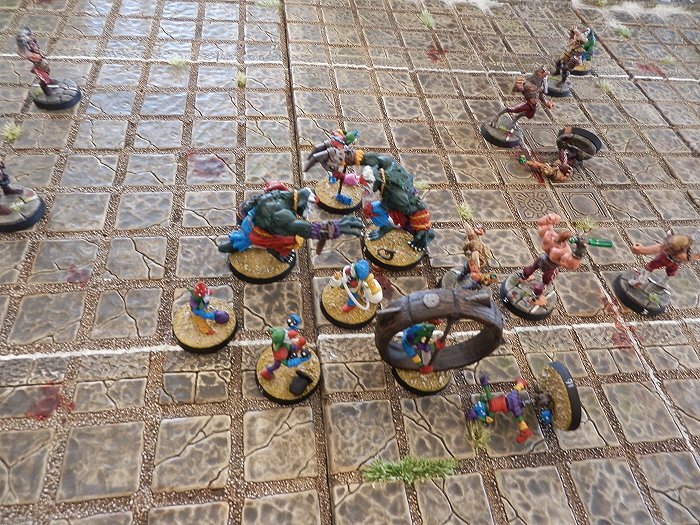 Thanks for doing the hobby of Blood Bowl justice!